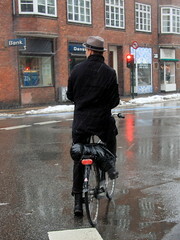 Copenhagen gent waiting at a red light. Read all about the specially-designed railing he is holding onto. 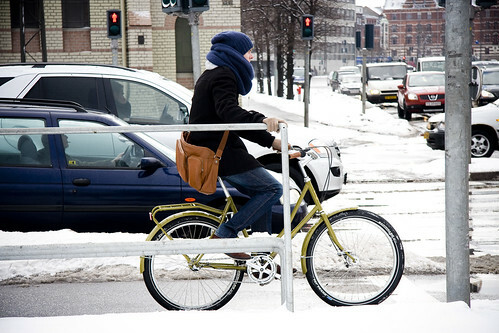 It's how we spoil cyclists in Copenhagen. A gentleman on a late model Raleigh bicycle. See the lovely models available in Denmark here. The world needs more dapper hats. 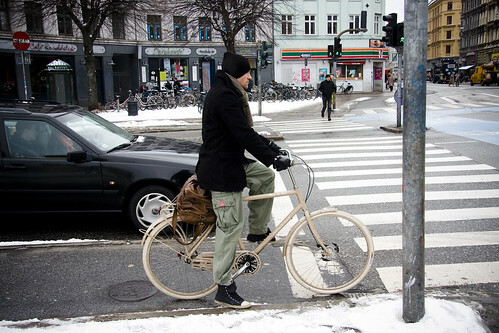 Great bicycle in the second pic! I like the cool bikes but the rail thingy is amazing. It sure beats trying to do a track stand at the light. I just bought my first city bike in my too-many-years-to-mention career as a cyclist. It's great for Valencia, Spain which is as flat as a tortilla but I would die on this pig trying to hump up one of the mammoth hills of Seattle. I'm officially sick of this site! It's just too depressing for me... living in Australia... having to read about your amazing cycle culture and all the benefits. It's. just. not. fair! Cycling in Australia is still nearly always simply viewed as a sport. The notion of cycling as just transport disappeared from our psyche a long time ago. Think I might just have to move to Europe after all.